I didn’t feel too stiff on the Monday following the half, but had a walk after work to stretch out the legs, plus some foam rolling. On Tuesday morning my left hamstring was super tight, so more foam rolling was endured. I had a run in the evening- just a short and gentle one, and it did help to ease out the aches a little more. On Wednesday at work we walked through the woods and to the bakery at lunch time, and I caved and got a Belgium bun- I had half after yoga (which again was very much needed) and then half the next evening. On Thursday we went for a team meeting lunch at Starbucks and sat outside in the sunshine- glorious! Also, Sainsbury’s stock Larabars! And the best flavour- choc peanut butter- I was very excited to find this out as I usually bring back a few when I go to the USA. 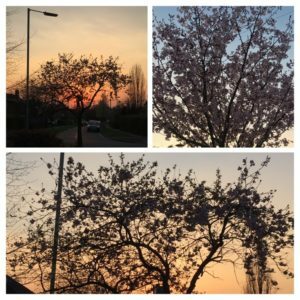 On Thursday evening I had a lovely 4.5 mile run as the sun was going down- all the blossom looked so pretty in the late evening light. On Friday I had a Very Embarrassing Incident in Sainsbury’s- I had to stop on my way home to get hot cross bun ingredients for work, and as I was unfolding one of the bag for life’s (lives?) a massive spider crawled out. I threw the bag on the floor and shrieked, before picking the bag up (and watching the spider crawl away)- luckily I didn’t throw the spider at the checkout lady, and she just laughed at me. The whole time I was packing the shopping up, she just kept laughing. I was very apologetic but it was a big spider! Urgh! I had to have a cup of tea and a biscuit when I got home to calm down! After dinner and packing we headed down to Brighton for part of the weekend. On the Saturday morning I was off to Preston Park parkrun as it was the closest to the hotel. 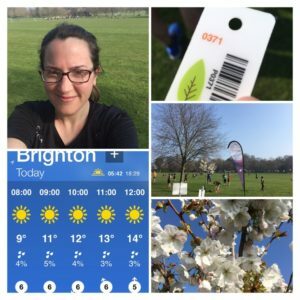 It was so sunny and warm, and the parkrun was absolutely jam packed! My legs still felt fairly heavy so I didn’t go too fast, keeping just in front of the 30 min pacer and enjoying it. Of course it was then time for pancakes at the amazing Cafe Coho- I met Andy at the station and we headed to breakfast straight away. I went for the banana and hazelnut ones this time- they are much sweeter than the normal berry ones, but they were a nice treat. 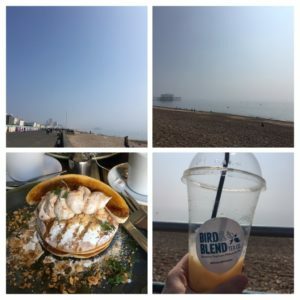 After a shower we headed to get a drink from Bird&Blend (iced drinks- spring is here) and then walked along to Hove. We had to be fairly quick as Andy was off to the football, so I then had a bit of time to wander around the shops. 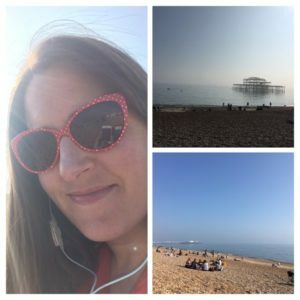 I’d packed my headphones and a magazine, and the weather was so gorgeous that I sat on the beach for a bit (and yes I had suncream on). 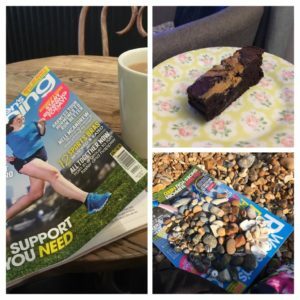 A bit later I headed to a cafe to have a cup of tea and read my magazine, as on the beach I listened to podcasts and collected a few pebbles. Once the football was finished we met up and had a quick dinner at Leon (oh how I love their hummus) and then drove home. I’d picked up a peanut butter brownie in the afternoon so we shared that when we got home. A bit of a flying visit to Brighton, but just as lovely, especially with the amazing weather. Are you a fan of spiders? Which brownie flavour is your favourite? 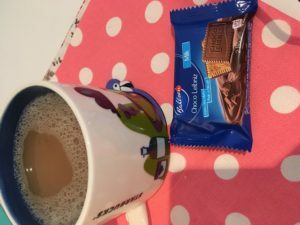 Author Maria RunsPosted on April 5, 2019 Categories General ramblings, Running, Stuff I love! 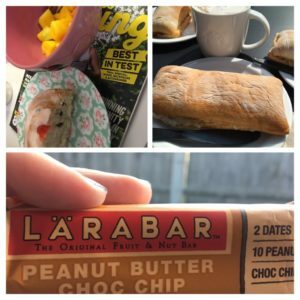 I didn’t know Larabars were sold in the UK – I always used to bring back packs from trips to the US! I hate spiders so I’m glad they it’s too hot for them in Dubai! Well I didn’t know they were until last week! I always used to bring some back with me too! Oh god I’d have been the same with the spider. Horrible horrible! Previous Previous post: Lee Valley half marathon 2019- so close!